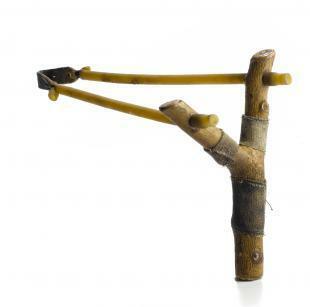 Learning how to make a slingshot could be an easy way to provide food for your survival party in a world where guns are not available or in situations where you want to conserve ammo, or even be able to hunt with stealth. A bow and arrow is another option, but you will find that a slingshot allows you greater flexibility as you can use just about anything that is small and hard as a missile. Wood - the best slingshot frames will give you a certain flexibility as you pull the band back without completely bending or snapping. Likewise, you need to avoid hard woods that don't flex at all as the bend will give you the distance and power necessary to make the kill. The best woods are considered to be dogwood, hickory and oak and these should be fairly plentiful in most parts of the country. Angle - the typical image of a slingshot is a straight Y, but the trick is to find a branch that actually bends back at roughly 30 degrees from vertical. The branches should split apart at approximately 45 degrees to give you a wide enough gap for proper size missiles without losing kinetic energy into the frame. However, you shouldn't get hung up if you can't find a piece of wood with exactly the right dimensions. You can either make do with what you find, or use a thin wood carving knife to trim it to the right dimensions. Size - bigger isn't always better when it comes to slingshots, as you can run the risk of putting too much strength on the frame. You should look for frames that are thicker rather than longer as they will last you longer. Again, you'll need to be careful not to choose wood that is too thick as it won't give you enough flexibility to get the necessary power and distance. Strong bands - a strong frame needs a strong rubber band. You can use thick commercial bands or get hold of specific slingshot bands which will have wider central parts to take your missiles. You should buy these ahead of time as it will be almost impossible to get hold of them in a survival situation and there are no natural materials in the US that will provide the same strength and flexibility as rubber. Connection - the key to getting a good amount of power is the connection of your band to your frame. The best way to do this is to drill small holes two inches from the top of each branch. You then strip the band down so that it will fit through the holes. Finally tie a small wooden stake on the end of the bands to stop it going through. 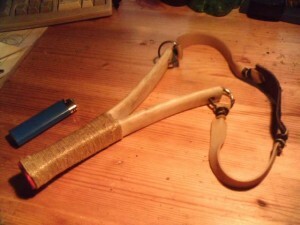 Once you've practiced how to make a slingshot, you need to test it. Start by using small missiles like pebbles and acorns and slowly increase the amount of draw you use over the course of a few days. This will allow you to let the rubber band settle without stretching and expanding it too far. Once you feel comfortable, start using larger missiles such as rocks, ball bearings or even marble. You should also give the other people in your survival party plenty of opportunities to shoot with the slingshot so that they're not reliant on your skills.